Canberrans have pulled their winter jackets out early this year, last week’s minus 6.9 degree minimum was the coldest May morning since 1957. Climatologist Acacia Pepler, of the Bureau of Meteorology, said this autumn has seen below average temperatures and rainfall. ”It has definitely been drier and colder than average over the last few months, but it hasn’t been record breaking,” she said. To date, Canberra has seen 62.2mm of rainfall this autumn. It’s more than 2008 (60.2mm) but it’s nowhere near last year’s 186.8mm. 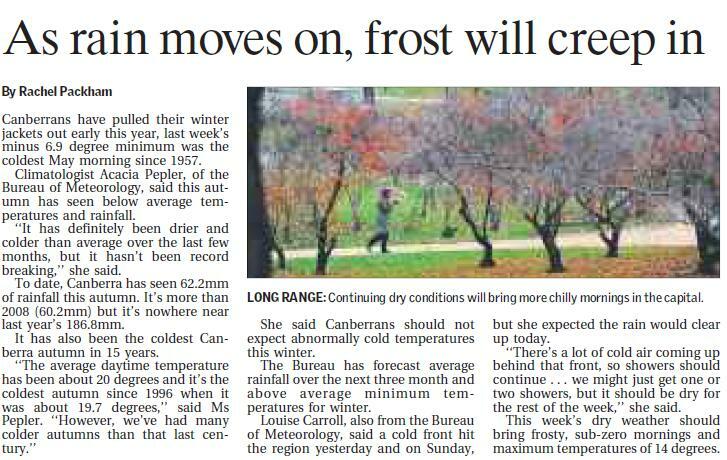 It has also been the coldest Canberra autumn in 15 years. She said Canberrans should not expect abnormally cold temperatures this winter. The Bureau has forecast average rainfall over the next three month and above average minimum temperatures for winter. Louise Carroll, also from the Bureau of Meteorology, said a cold front hit the region yesterday and on Sunday, but she expected the rain would clear up today. ”There’s a lot of cold air coming up behind that front, so showers should continue … we might just get one or two showers, but it should be dry for the rest of the week,” she said. This week’s dry weather should bring frosty, sub-zero mornings and maximum temperatures of 14 degrees.